Need an extra room but don’t want to go to the hassle and expense of building an addition on your house? Don’t let the political wrangling over the administration’s proposed Mexican-American wall give these all-important structures a bad name. A new wall can give your home new life: You can use it to create a new room or divide an existing one. And erecting a non-load-bearing wall probably is not nearly as complicated as you might think. Professional builders consider it a relatively easy task, even for the weekend warrior carpenter. It shouldn’t take much longer than a day, if you prepare properly. So if you have a day to spare and are ready for that extra room, roll up your sleeves, put on your work gloves, and follow these simple instructions. You’ll need gloves, goggles, a chalk line, a drill with screw attachments, a stud finder, a plumb line, a hammer, a level, measuring tape, drywall tape, a paintbrush and roller, a pencil, and a stepladder. The materials involved in building a wall include the following: Drywall panels; drywall tape; wood screws; construction adhesive; crown and base molding that match the rest of the room; joint compound; precut, kiln-dried wall studs (2-by-4-by-8 or 2-by-3-by-8); and small nails. A nail gun would make everything infinitely easier—try to get your hands on one. 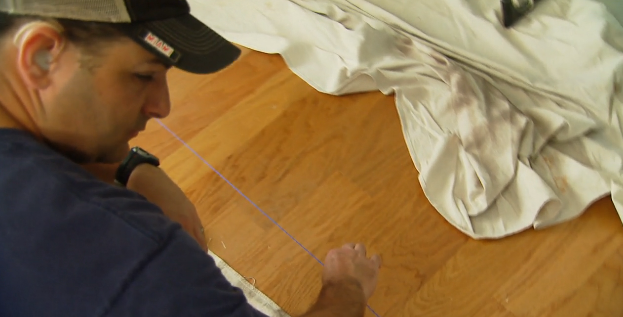 If there’s carpeting, linoleum, or any other soft surface on the floor where the wall will be constructed, remove it. If the floor is a hard surface like wood, you can attach the base (floor) plate right to it later. Snap a chalk line across the floor where you’ll be building your wall, to ensure that it will be straight. 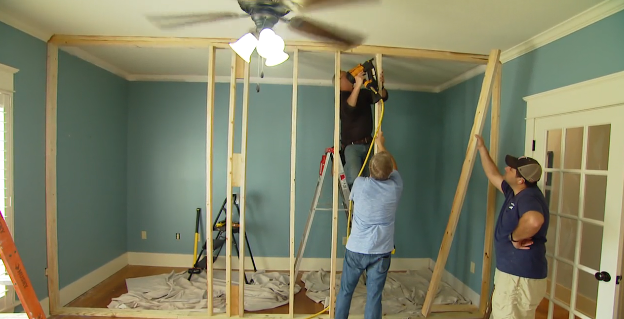 If there’s molding on the wall against the ceiling or floor where the new wall will intersect an existing wall, notch or cut out the molding so the new wall can stand flush against the existing one. 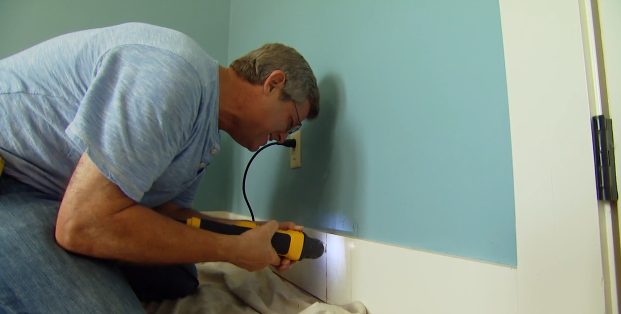 Since you can’t just nail vertical studs into the floor, you need to install a base plate. 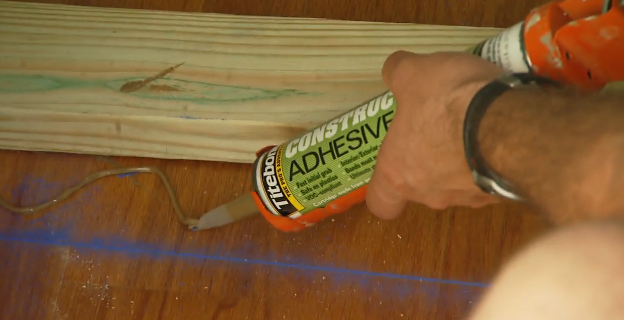 Apply construction adhesive to the floor along the chalk line where the wall will be built, then lay down the base plate (a 2-by-4) on top of it. Next, use screws or nails to secure the base plate to the floor. Your wall won’t hold if you attach the vertical studs directly to the existing ceiling, so you need to install a top plate. The top plate goes directly above the base plate. You can use a plumb line to make sure the base plate and the top plate are perfectly positioned and straight. Nail the top plate to the ceiling joists above. Then, to prevent sagging, nail a second top plate directly under the first one to give it double support. Fill in the wall studs by nailing them vertically between the top and bottom plates at 16-inch intervals. You can use the plumb line to make sure they’re straight. 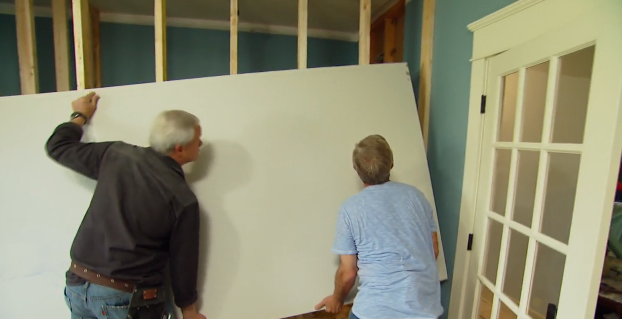 Frame any doors, windows, or other openings you plan on making in the wall. This complicates things considerably, however, so you’ll want to watch the accompanying video for more detailed instructions. 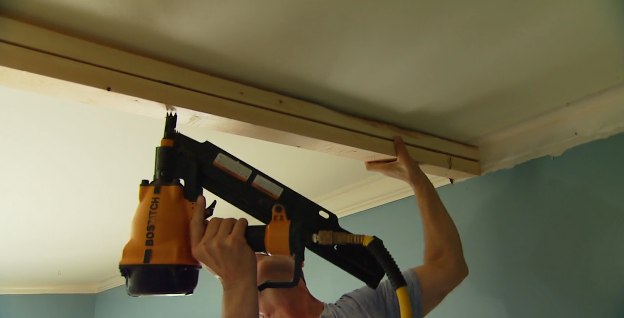 Install the drywall over the vertical studs by attaching it with small screws. Tape the resulting seams with drywall tape, then smooth over that, and the screws, with the compound to hide the joints and fasteners. Your new wall should feel smooth, at this point, but it will look splotchy where the joint compound was applied. 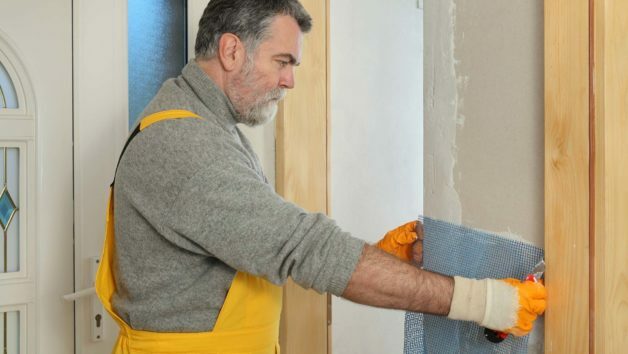 Another option is to use lathe and plaster rather than drywall, but that’s a lot more complicated and requires a whole different set of instructions. 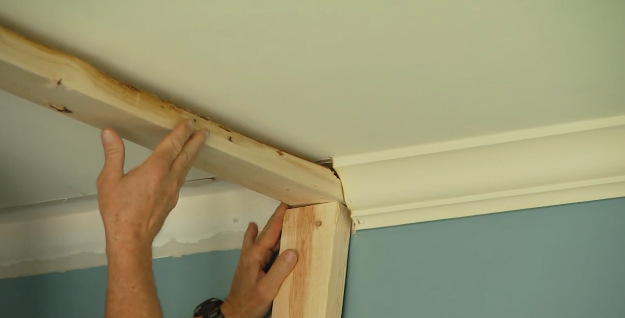 If you’re planning on matching molding to the rest of the room, nail or screw the base molding where the wall meets the floor, and the crown molding along the ceiling line. You’re almost done! Step No. 9: Paint that wall! 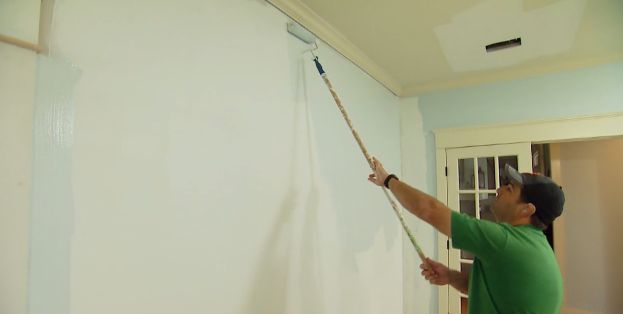 Last but certainly not least, prime the wall, let the primer dry, then apply paint with a roller or brush. If you’ve measured 20 times, built the wall straight, and applied the compound smoothly, no one should be able to tell that the wall wasn’t part of the original floor plan. 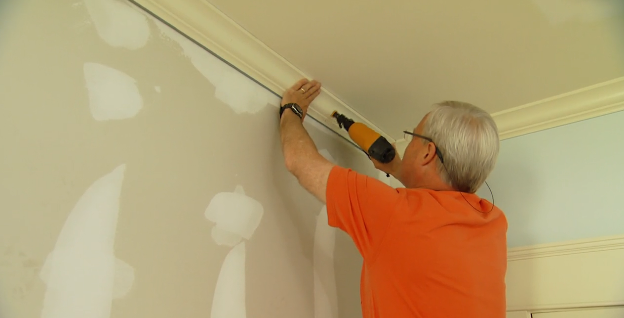 For more details, watch the video below, courtesy of Today’s Homeowner with Danny Lipford.